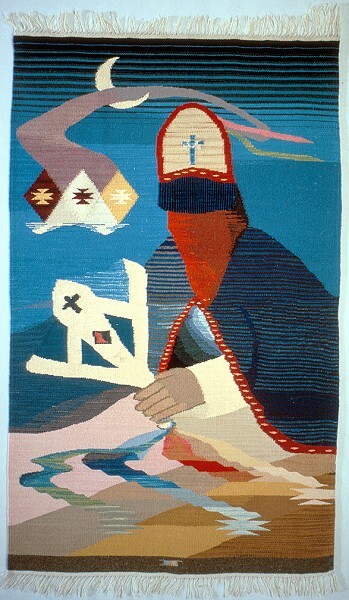 Irvin Trujillo based this piece on his childhood memories of the Christmas Day Matachines dances that he saw at San Juan, an Indian Pueblo located about 15 miles northwest of his home in Chimayó, New Mexico. This textile is very innovative, showing few of the design elements typical of the Chimayó weaving tradition. The influence of this tradition is more evident in the design of a second Trujillo piece shown below. Here the central motif that characterizes much of Chimayó weaving is an abstract spider. 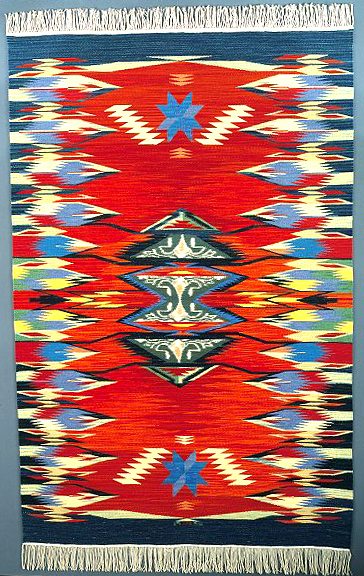 The dyeing method, however, is ikat, seldom seen in northern New Mexican Hispanic weaving.